There are a lot of things to love about Glaiza De Castro, but one things for sure, she's one heck of a woman. We often see celebrities use their status for different things but this time, the Kapuso actress is helping the PGH Pediatric Cancer Ward. We all know how expensive treatments are for Cancer patients, not to mention chemo therapy and medicines. It seems she's always involved with kids, a cause that's pretty close to her heart. 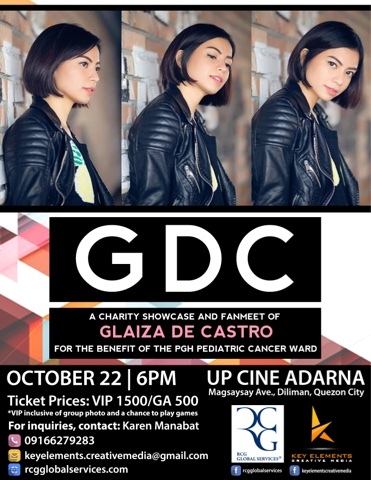 The show will be entitled GDC Charity Fanmeet and will happen on Saturday, October 22 at the UP CIne Adarna inside the University of the Philippines campus. She's also going to interact with fans and get to answer some of the toughest questions. She's also launching something very special that they're going to keep a secret until that date so if you are a Glaiza De Castro fan, this is something you shouldn't miss! Tickets only cost Php 1,500 for the VIP and Php 500 for General Admission. Proceeds from the concert will go to a very good cause as mentioned earlier so if you want to help, this would really be a great opportunity to do so. See you there!